These tender, melt-in-your-mouth Glazed Yeast Donuts can be enjoyed on their own or with a million different fillings, glazes, or toppings. I feel like this recipe needs to be shared because it is the starting point for so many other recipes. Like these Strawberry & Cream donuts. I mean, you need a donut to put the good stuff in, no? But what I love about these is that they are completely fabulous on their own. They’re based on The Pioneer Woman’s donut recipe, and are tender, melty bits of fried dough. And, dare I say, they are vaguely reminiscent of Krispy Kreme donuts, a staple of my childhood vacations to visit family in Atlanta. I feel old admitting that I remember when KK was only available in the south. But for the glaze, I used Alton Brown’s recipe, and it was a bit of a breakthrough. One of my main frustrations with donut making is that the frosting takes forever to actually harden and dry. The answer, apparently, is using heated milk to make the frosting, because much to my shock, the frosting hardened almost immediately. It was also shattery and thin, just like the best glazes you find in the donut shops. Excited was an understatement for my reaction. Yes, I realize I need a life. But shattery glaze is pretty monumental, IMHO. 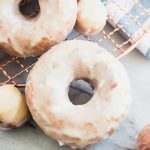 This recipe makes about 12 donuts, but if you have a crowd to feed you can definitely double it. Most of the work can even be done ahead. Simply make the dough ahead of time, and roll and let them rise just before frying and serving– does breakfast get much better than this? These are tender, melt-in-your-mouth glazed yeast donuts that can be enjoyed on it’s own or with a million different fillings, glazes, or toppings. To make the dough: Warm the milk either over the stove or in the microwave, then pour it into the bowl of a stand mixer that has been fitted with a dough hook. Add the sugar and stir until dissolved, then add the yeast and allow it to sit for 5-10 minutes or until it becomes bubbly. Add the eggs and melted butter and mix them in. While the mixer is running on medium-low, stir in the flour and salt until completely combined, about five minutes. Turn off the mixer and allow it to rest for 10 minutes. After it has rested, move the dough to a clean, oiled bowl and turn it to coat all of the dough in oil. Cover the bowl with plastic wrap and put in the refrigerator for at least two hours, or up to 1 day. To make the donuts, remove the dough from the refrigerator and turn it out onto a floured surface. With a rolling pin, roll it out until it is about 1/3-1/2″ thick, then using a large circle cutter (something about 3-4 inches, I like to use a wide-mouth jar lid), cut as many donuts as you can. Using a small cutter (about 1″), cut a hole out of the center of each donut. Lay them out on parchment lined baking sheets, leaving about an inch between them. Repeat the rolling & cutting with the dough edges until you have used it all. Gently lay plastic wrap over the top of the doughnuts, and let them rise for 1-2 hours, or until they are puffed up and soft when you touch them. If your house is cold, turn on your oven for about 2 minutes then turn it off, just to make it slightly warm. Place the trays of donuts in the oven. In a medium, heavy-bottomed pan, heat at least 2″ of oil to 350°. Carefully drop 2 or 3 of the donuts in and fry for about 2 minutes on each side, or until each side is golden brown. Remove from the oil to a cooling rack and repeat with the rest of the donuts and donut holes, keeping the oil around 350°.